The ever-growing popularity of wine consumption is something that’s being addressed around the world, with supply constantly seeking to keep up with demand. 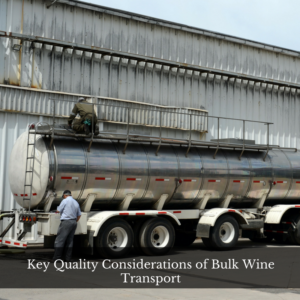 Delivering the product in question through bulk wine transport is the main task for a wine transport company, yet the job also entails making sure that the quality is constantly maintained. The type of wine transport Dallas businesses demand has that concept of quality at its core, with the method of delivery essentially offering a choice between stainless steel ISO tanker or a more recent phenomenon, flexitanks. Both can help extend the time frame for a wine’s quality, which can ultimately enhance the bottom line for a business. The past method of delivery for a wine transport company used to simply involve pouring the product into the bottles being used and making sure that its integrity was maintained throughout the trip. However, the reality is that once wine goes into any bottle, the aging process kicks off and getting it on the shelf as quickly as possible is imperative. One way to delay the onset of that aging is through bulk transport of the wine, whether by ISO or flexitank. When it comes to wine transport Dallas businesses have to handle, taking this approach ensures that the quality of the wine is maintained. In an industry as competitive as this marketplace, that might end up meaning the difference between success and collapse of a business. Besides the consideration of premature aging and the reality of potential breakage of those bottles during transport, the issues of available space during transport Estimates of no more than 13,000 bottles are the norm when they’re shipped in containers. That may sound like a lot, but when compared to the flexitank or ISO, it becomes woefully inadequate. That’s because the flexitank can handle roughly the equivalent of 32,000 bottles, while the ISO is able to accommodate even more at about 35,000 bottles. Those are numbers that quickly add up when the profit margin is tight. The money saved though increased amounts is supplemented for those using flexitanks, That’s because of the reduced level of materials that may come into contact with the product, thereby cutting the risk for contamination. In addition, the migration rate of oxygen takes a steep drop with such usage, which helps limit the horror of spoilage. With ISO tanks, the lingering residue from past transports can sometimes lead to the development of contaminants. If concern exists for wine transport Dallas companies require, flexitanks can instead serve their purposes. Conceivably, the flexitanks are vulnerable to the same issues, but such bags can conveniently be tossed away to avoid such prospects. Transport of wine will usually be handled either on the road or by sea. The length of time for such travel demands that the product be protected from the inevitable temperature shifts that will take place. Flexitanks and ISO containers are much better equipped to maintain the standard temperature needed than traditional containers that have been used in the past. For more than 30 years, Kan-Haul’s ability to deliver as a wine transport company for their customers has made us a business that immediately comes to mind when such efforts are requires. So when the choice needs to be made, there’s no need to waste any time: contact Kan-Haul.